Espresso Cielo does not employ, in their words, Rockstar Baristas—you know, the java know-it-alls who look down on you for adding a packet of Splenda to your cappuccino. Instead, they share their knowledge of coffee and tea to anyone who asks, offering suggestions if you need a little nudging. 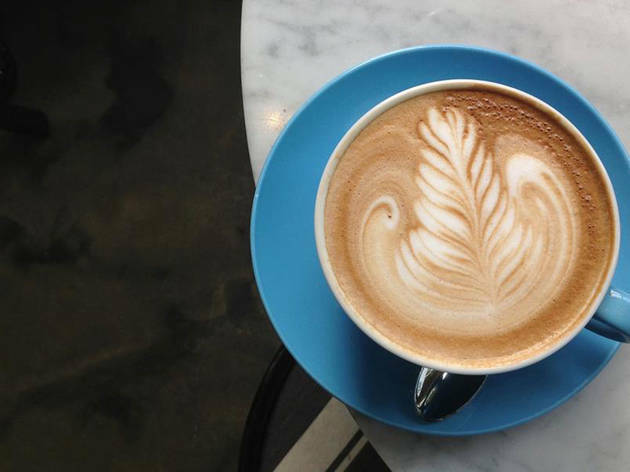 Cielo whips up your standard offerings using 49th Parallel coffee (lattes, cappuccinos, espressos); their larger portions are served in huge cups that look less like mugs and more like bowls. And for tea drinkers, a cup of Pacific Coast mint tea is perfect for foggy Santa Monica mornings. Free Wi-Fi and ample indoor and outdoor seating make this a spot conducive to hanging out for hours on end. 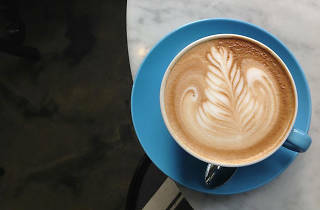 Located right below one of the parking structures on 2nd street in Santa Monica close to the promenade, this is a convenient and fun little coffee date meeting place. The lattes and loose leaf teas here are really yummy, and the interior deco has a very clean & sleek yet charming appeal. Macaroons were really good here as well. The service at the counter is very friendly & welcoming – definitely a great meeting spot to catch up with a friend at. Tonight was the grand opening reception for Espresso Cielo in downtown Santa Monica, just steps away from the Third Street Promenade. The café is located on Second Street, nestled in a parking structure between a chocolate shop and Jinky's. Espresso Cielo is stunning. It's a beautiful venue donning high ceilings, white tiles and single hanging chandelier lights. The luminous room has an arrangement of bar stools for the marble countertop, high-backed cushioned seats in the nook and tea-for-two style tables with a view. The reception included some off-menu food (delicious), but the real star was the coffee and tea. Their menu boasts a variety of caffeinated beverages and black, green and herbal teas. I had their chai tea latte and the matcha tea latte. When it comes to lattes, I drink them with all sorts of milks: whole, percent, nonfat, coconut, almond and soy. What can I say? I'm indiscriminate towards lait. This time, I used soy. I like how chai and matcha taste with soy, especially when it's vanilla soy. The chai was creamy, delicious and subtle with its spices,. Matcha was the same, albeit earthy and not spicy (of course). I have to commend the staff - they pulled through the crowd with ease. Any coffee and tea drinker should definitely check them out!